The Essential Network: Success Through Personal Connections - John L. Bennett - This book is about establishing, maintaining, and reaping the benefits of connections. It incorporates many personal stories to illustrate the productive results that can occur from building connections. These include people who have found life-partners, avoided personal and financial disasters, made career changes, built businesses, and met famous people. Larry's Review: The principles of business networking in an easy-read and understandable format. Highly recommended! The Inner Lover: Using Passion As a Way to Self-Empowerment - Valerie Harms - Understanding why we are passionately attracted to certain people can lead us to the "Inner Lover," a creative aspect of our own nature. The author presents techniques of journaling, dreamwork, and imaginal dialogues to guide you on an adventure of self-discovery. Larry's Review: Is the fire of passion going out? Valerie's wisdom will help you reclaim your passion. She will take you by the hand and lead you to transformational creativity and fulfillment in relationships. A great book for potential "cheaters." Arizona Getaways for the Incurably Romantic - Pamela Swartz - Step-by-step instructions plus all the info you need to plan and perfect your ideal 24 to 72 hour romantic escape. Includes descriptions of 45 of the most uniquely romantic properties in Arizona and much more. Larry's Review: Not just another travel guide, this book is a trip to read! You'll find a romantic collage of hundreds of ideas to make your getaway a playful and passionate success. It will work magic in your relationship. It's sure to light the romantic fire and keep it burning. 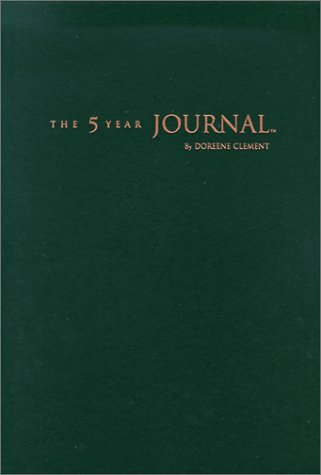 The 5 Year Journal - Doreene Clement - This book offers a positive format for growth and healing through journaling. Use it to capture and summarize your daily experiences, thoughts, and feelings. Complete with quotations to encourage and inspire, plus a valuable workbook section. Larry's Review: I believe "The 5 Year Journal" is the very best and most complete daily journal you can own! A beautiful hard cover book in which to record your most private emotions, thoughts, feelings and sensitivities, and keep in your very own secret place. This extraordinary book will help you learn journaling in a very personal way. I highly recommended it. Read For Your Eyes Only!.